The part number listed in the document is to be returned and only the replacement part number provided in the document is to be ordered. This bulletin applies to any repair that requires replacement of the air conditioning compressor and details how to run a odis gff test plan. This bulletin provides troubleshooting for brake clicking. This informational bulletin explains why a slight rattling or click noise can be heard from the front of the car at about 25 mph. This bulletin instructs the technician to replace the brake pressure sensor when the warning message ?brake servo restricted? appears. This bulletin provides information regarding vibrations or movement that are felt in the wheel. This informational bulletin contains knowledge on why oil may appear on one or several of the shock absorbers. This informational bulletin contains instructions for proper brake maintenance. This bulletin contains repair instructions for when an oil leak is present around the atf sump. This bulletin contains repair instructions for when there is an oil from the transmission (0ck, 0cl, or 0cj). This bulletin contains repair information for a rattling noise underneath the vehicle. This bulletin contains a software update for when the sos message appears but does not log a dtc. This informational bulletin contains information on why acc sensor could be deactivated. All models: vehicle preparation section: added "using guided functions" to "set adaption channel to enable cd ripping (if equipped)" a8 and q3: audi connection: removed: "turn on the wireless network (if equipped)"
On audi vehicles with audi smartphone interface (asi) manufactured within a specific period, an error may occur in the smartphone connection. On audi a4, a5 and q5 vehicles manufactured within a specific period, the service interval display does not show all parameters. as a result, the number of days remaining until the next service is due are not displayed correctly. This repair authorization contains instructions for various symptoms for the interior wiring harness. This is a pss for a software concern in the mmi with a intermittent display change. This bulletin contains repair instructions for when after pdi is performed, the customer states that the audi connect services are not functioning. This bulletin contains a software update that addresses when attempting to close a half-open window, the window opens instead of closing. This technical bulletin provides information regarding a rattling noise or vibrations when creeping in reverse or drive. This bulletin contains repair instructions for when "engine start system malfunction" message displayed in instrument cluster or the start-stop button sticks with dtc b143c29. This informational bulletin states that when a sporadic or permanent warning message appears with no dtcs that the technicians need to postpone repairs. This informational bulletin contains instructions for minimizing the risk of an unintentional opening of the trunk lid with the remote. This bulletin contains repair information for when the ambient light in the outer door handle does not work and/or water ingress into light housing. This bulletin contains information about the start/stop system. This informational bulletin provides an explanation for the customer regarding known software issues with the mib & mmi3g+ bluetooth security profile. This bulletin provides a software solution for vehicle code entry fails for the key user. This bulletin contains repair instructions for customer may report that the top view camera does not load. only the visual parking aid overlays on the right half of the screen and dtc u104c00 is logged. This bulletin contains a software update to correct when only the static outlines of the park aid are displayed. This special notice is to inform dealers to return all rear window regulator part numbers listed in the document that are prior to generation 012s. This special notice is to inform dealers to return all window regulator part numbers listed in the document that are prior to generation 014s. This bulletin contains software update instructions for when there is a parking brake message (no functional issue) without any dtc's logged. This bulletin contains instructions for when dtc u030000 appears and ?all wheel drive malfunction message? is displayed in the instrument cluster. This bulletin contains repair instructions for when a message in instrument cluster ?audi pre sense: currently restricted. see owner?s manual? appears. dtc c1114f0 and c1114f3 are logged. This bulletin provides software update instructions for warning messages in the mmi when a user tries to manually refresh data or the vehicle cannot be locked or unlocked. This bulletin details why the radio sounds different due to different hardware. This informational bulletin is for a sporadic dtc that does not cause functional issues in the vehicle. This repair authorization is for the launch of the q5 to encourage dealers to supply vital technical information. The message "oil minimum warning, add one quart of oil" appears in the instrument cluster, but the oil level is above the minimum level. there are no dtcs related to oil level stored in the ecm memory. the oil level sensor is defective. This technical service bulletin explains how to diagnose and resolve issues with audi connect online destination search, google earth navigation view, and inrix online traffic. This technical service bulletin provides troubleshooting information for the vehicle locking system. This technical service bulletin provides troubleshooting for the battery for a condition that causes no start due to low voltage. This repair authorization is for special vins that are part of the audi on demand and audi at home program. 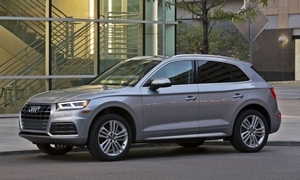 This bulletin explains the details of the audi launch allowance program for the new 2018 q5. This bulletin provides instructions for repairing a vehicle with a washer solvent light on but the level is correct. Trunk inspection section: added: "check battery clamps for proper torque refer to elsa pro for specification"
This technical bulletin provides instructions for an an error message and updating with an svm code. Infotainment section: added: "if audi connect is not functioning with an error message, ?the myaudi server is currently unavailable?, reference tsb 2048436 to activate service"
Audi connect section: added: "if audi connect is not functioning with an error message, ?the myaudi server is currently unavailable?, reference tsb 2048436 to activate service"
This bulletin contains instructions and trouble shooting for how to take the vehicle out of transport mode. This special notice is to inform dealers to return all parts that are generation 07s and lower. Vehicle preparation section: added the following checklist item with step-by-step instuctions: perform v544 radiator shutter motor adaption. prerequisite: engine off, ignition on to activate the test plan follow the below steps: 1. Settings: removed: "load on-board tutorials"
This document contains the revised checklist for the audi technician reference document. please see pdf change file for details. This special notice is to inform dealers to return all part numbers listed and order successor part numbers going forward. This document contains information on the audi side assist update.